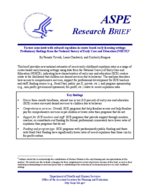 This brief provides new national estimates of recent early childhood expulsion rates in a range of center-based early learning settings using data from the National Survey of Early Care and Education (NSECE), indicating how characteristics of early care and education (ECE) centers relate to the likelihood that children are denied services due to behavior. The analysis describes how access to comprehensive services, support for professional development for ECE teachers and staff, funding source (e.g., Head Start, public pre-K, private, etc. ), and program sponsorship (e.g., non-profit, government sponsored, for-profit, etc.) relate to recent expulsion rates. Over a three-month timeframe, almost one in ten (8.8 percent) of early care and education (ECE) centers surveyed denied services to children due to behavior. Overall, ECE programs that help families access and help families pay for comprehensive services expel children at lower rates than programs that do not. ECE programs that provide support through mentors, coaches, or consultants and funding for formal professional coursework have lower rates of expulsion than programs that do not. ECE programs with predominantly public funding and those with Head Start funding have significantly lower rates of recent expulsion than those run by for-profit entities.